A toast is in order, but make it marshmallows instead of champagne. Victor E. Sower was selected as one of only 15 college and university professors in Texas and only the ninth in Sam Houston State University history to receive the prestigious Minnie Stevens Piper Award. Sower, 58, a professor of management in the Department of Management & Marketing, will receive $5,000 from the Minnie Stevens Piper Foundation of Texas. "To be selected as the SHSU nominee for the Piper Professorship award is a great honor," said Sower. "Actually winning the award is overwhelming. "I believe that winning the award is more a testament to the overall quality of our university than to my qualifications as an individual faculty member," he said. "We have many faculty members throughout the University who are deserving of being named a Piper Professor. "I am fortunate to work with such an able group from whom I have learned much and who by their example continually challenge me to excel in my work." This is the second consecutive year that an SHSU professor has received the award. Last year Caroline Crimm, professor of history, was selected. Past SHSU Piper Professors include Hazel Floyd (1961), George Killinger (1968), Mary Frances Park (1981), Fisher Tull (1984), and current faculty members Ralph Pease (1987), Witold Lukaszewski (1991), and Rolando V. del Carmen (1998) in addition to Crimm. Sower's educational background includes a bachelor’s in chemistry, from Virginia Polytechnic Institute, master’s in business administration from Auburn University, and Ph. D. in operations management from the University of North Texas. In addition to his many teaching accolades from students and colleagues, he lists 70 books, publications (refereed and non-refereed), manuals, chapters, cases, presentations, papers and grants. He is one of only three SHSU faculty members to receive two or more of the three excellence awards given by the university each year. He won the Excellence in Teaching in 1996 and Excellence in Research in 2001. It would be no surprise if he someday joins James S. Olson as a winner of all three. His bio also lists 52 service involvements. Sower sometimes uses unconventional tactics to get the attention of students. About 10 years ago he sensed that one of his classes—probably before his reputation as an excellent teacher had spread on campus—was frustrated and angry. The class average on the first test was unusually low, which the students of course thought was because the test was too hard. Sower brought a bag of marshmallows to class, handed one to each student, and invited them to chunk away. Then, with white smudges all over him, he gathered up the marshmallows and fired back. The message—learning is a two-way street. They were unhappy with him and he was unhappy with them. He would do his part if they would do theirs. The marshmallow barrage turned that class around, and Sower didn’t feel a need to use that tactic again until last year. This time it improved a first test below-average class score of 60 into a second test above-average 78. He also teaches courses in the College of Business Administration in operations, management, purchasing, and international business. 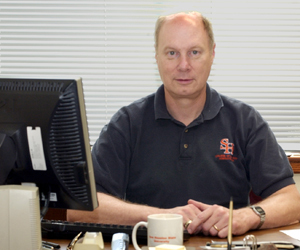 Before he came to SHSU in 1990 he worked for two divisions of the Tandy Corporation, with the Ampex Corporation, and with the U. S. Army Chemical Corps, in which he served as an officer for two years. "Dr. Sower posseses a keen intellect, certainly a ready wit, compassion for the realities of life and perhaps most importantly, a personal discipline that transcends to his students in the form of surpassing the status quo," said former student Pamela J. Zelbst. "It is simply not acceptable to do less than one's best if you are fortunate enough to be one of his students."